&quot;Lea Anderson draws her influences from many sources to create work which challenges stereotypes.&quot; To what extent is this seen in the work you have studied? "Lea Anderson draws her influences from many sources to create work which challenges stereotypes." To what extent is this seen in the work you have studied? 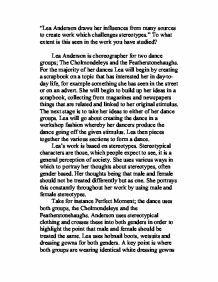 Lea Anderson is choreographer for two dance groups; The Cholmondeleys and the Featherstonehaughs. For the majority of her dances Lea will begin by creating a scrapbook on a topic that has interested her in day-to-day life, for example something she has seen in the street or on an advert. She will begin to build up her ideas in a scrapbook, collecting from magazines and newspapers things that are related and linked to her original stimulus. The next stage is to take her ideas to either of her dance groups. ...read more. She portrays this constantly throughout her work by using male and female stereotypes. Take for instance Perfect Moment; the dance uses both groups, the Cholmondeleys and the Featherstonehaughs. Anderson uses stereotypical clothing and crosses these into both genders in order to highlight the point that male and female should be treated the same. Lea uses hobnail boots, wetsuits and dressing gowns for both genders. A key point is where both groups are wearing identical white dressing gowns and wigs and they all perform the act of getting ready, this being a stereotypical female thing to do. A lot of unison is used as this highlights the fact that everyone is doing the same. ...read more. Lea likes to do this in order to state that clothing should not determine who we are. Black Rose of Mandela used a lot of unison. Both groups were involved and wore identical clothing consisting of stilettos, Basques, fishnet stockings, whips etc. The dancers portrayed the stereotypical image of a prostitute or a woman of that nature. Lea, in conclusion bases the majority of her work on stereotypes, she concentrates on forming strong and striking visual images on stage and film. She constantly outlines the fact that men and women are equals and tries to defy the various things that define the genders e.g. clothing and stereotypical gestures. This is outlined in her work we have studied which contains strong examples of where things stereotypical to a specific gender have been applied to both or reversed. ...read more. In another situation where partners would sit across from each other at a desk, the person playing high-status would have his legs imposing on the others space, showing control of the situation, whereas the low-status character would keep to his own space, speak quietly and maintain little eye contact. In Two Hands true mateship is amply depicted. When Jimmy is in trouble, after losing ten thousand dollars, and Pando's gang wants to kill, Jimmy's friends (not fearing to commit a crime for mateship sake) help him to repay Pando by robbing a bank together. One of his mates was shot dead by the police. Dynamics in this context are the how of dance. This is made up of time, weight, space and flow. Mood is a temporary state of motion or attitude. It is an expression of the manner of an action. Swan Lake is made up of four acts, each of which is broken down into scenes. The key objective of the college was to produce experimental work and push conventional dance boundaries. Much of the topics the dance focussed upon included social politics. Ideas from Judson Dance Theatre's initial work were discarded during this period and new dance in Britain became increasingly motivated by social and political subject matters.